Education for sustainable development (ESD), its implementation and its efficiency to build sustainable communities, is a major concern for researchers and policymakers. The announcement of 2005-2014 as the Decade of Education for Sustainable Development (DESD) by the United Nations (UN) encouraged worldwide implementation of practices intended to contribute to sustainable development. The central goal of DESD was to facilitate the accomplishment of the Millennium Development Goals and to advance ESD globally (UNESCO, 2009). In 2015, the UN launched the Sustainable Development Goals (SDGs) as an extension of MDGs. However, various controversial opinions arose regarding the concepts of ESD in respect of environmental education (EE), considerations of neoliberal ideology, and, more importantly, contextual differences in use (Jickling and Wals, 2008; Hopwood, Mellor and O’Brien, 2005; Kopnina, 2012). Although authors expressed their worries by claiming that EE’s eco-centric perspective might be deterred with the emergence of ESD, this entry’s argument is grounded on McKeown and Hopkins’ (2003) perspective, which envisions the relationship between the two as healthy and symbiotic. UNESCO (2009) highlighted that the integration of ESD in education should be based on the settings and circumstances of each sub-region or country. Uzbekistan (Figure 1) started implementing ESD within its own context in cooperation with international organisations (IOs). This study aims to examine the endeavours to implement ESD in Uzbekistan. The entry focuses on higher education (HE) and teacher training institutions (TTIs), because these stages are efficient ways of disseminating SDGs by preparing future teachers and training current ones. The most challenging aspect of this topic is a research gap on an academic level; therefore, this entry relies on reports and resources of IOs. It serves to fill aninformation gap which can be helpful for students, teachers, and researchers who refer to Uzbekistan. Figure 1. The map of Uzbekistan (Retrieved from http://www.nationsonline.org/oneworld/map/uzbekistan-political-map.htm). Uzbekistan’s current state of economic transition is facing multiple challenges, but the most salient is the environmental challenge. 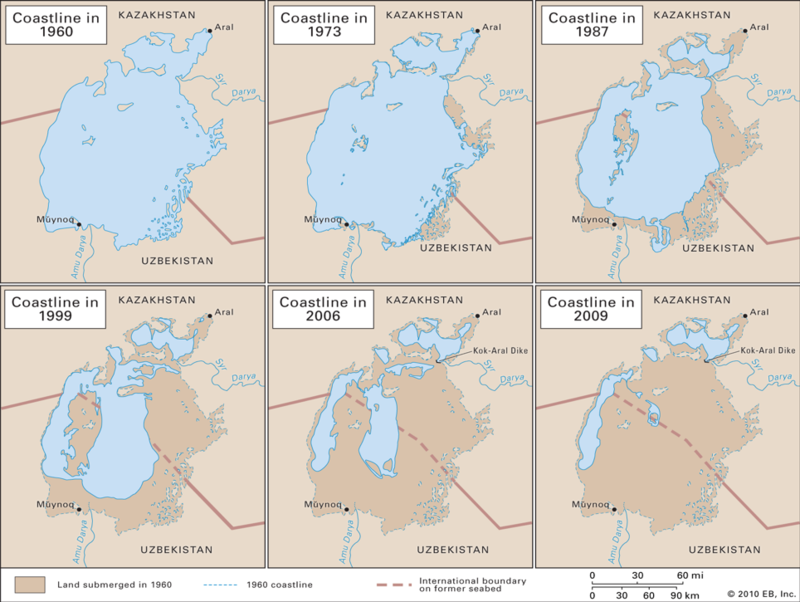 The Aral Sea catastrophe, one of the worst man-made ecological disasters (Figure 2), has led Uzbekistan to prioritise water policy. Being a double land-locked country, Uzbekistan has to rely on its restricted water resources to support sustainability in agriculture, the backbone of its economy. Therefore, SD became a priority direction in the development of the country and ESD has become one of the significant tools in raising awareness of the emerging environmental challenges. Figure 2. The Aral Sea Disaster (Retrieved from: https://www.britannica.com/place/Aral-Sea). As a member of the world community, Uzbekistan embarked on the policy for Sustainable Development (SD) in 1997 by establishing the National Commission for Sustainable Development to achieve the tasks set in the Agenda for the 21stcentury and the World Summit on SD in Johannesburg (Country Profile, 2002). This was followed by the adoption of the ‘State Strategy for Sustainable Development’ in 1999 (Regional Environmental Centre for Central Asia (CAREC), 2009). However, economic and agricultural recessions in the early years of independence caused shortages in funding for SD activities; thus the government relied on the aid of IOs, such as UNESCO, UNDP, and the World Bank (CAREC, 2006). In 2005, the National Commission for SD and its operational working group was abolished and its functions were allocated to a department in the Cabinet of Ministers. CAREC (2009) also stated that the authorisation of ESD into education systems had a ‘declarative character’, and in fact little was done practically (p. 48). Even though the ‘Concept of Education for Sustainable Development’ was adopted by Uzbekistan in 2011 (Vlek et al., 2017). Azizov (2016) reported that the integration of ESD in the curriculum was partial and not implemented in practice. Furthermore, the term ‘sustainability’ cannot be found in any of the state curricula of primary, secondary or higher education. These curricula may characterise some universal notions of ESD, but they cover only basic knowledge with a limited number of hours. In Uzbekistan, there are 78 tertiary institutions administered by the Ministry of Higher and Secondary Specialised Education and 16 teacher training institutions under the jurisdiction of the Ministry of Public Education. The implementation of ESD in HE and TTIs is mainly related to ESD’s environmental dimension. EE is compulsory in all tertiary institutions due to the law on the ‘Nature Protection’ of Uzbekistan in 1992. EE existed long before in higher education curriculum. There are two examples of integrating ESD at the tertiary level. The first is a partnership between the National University of Uzbekistan and the National Commission of the Republic for UNESCO. In cooperation, they established ‘the Coordination Council for EE and ESD’ which dealt with organising forums and seminars to introduce the goals of ESD, preparing Uzbek translation of multimedia programs for teaching and learning, and creating ESD guidebooks for teachers (UNESCO, 2013). The second is the launch of the UNESCO Chair on ESD at the State University of Urgench in 2011, to promote research, create a database on the subject, prepare and train staff, and establish cooperation between distinguished foreign researchers and the teachers of national universities ‘within the framework of train-the-trainers module’ in the field. (UNESCO, 2013, p. 27). Another major goal of this collaboration was to study and investigate the environmental conditions of the regions surrounding the Aral Sea. All regional universities provide bachelor’s courses on Ecology, Environment or Nature, and most technical universities have environmental engineering specialties. However, UNECE (2010) observed that no university curricula has fields of study such as ‘Environmental monitoring’, ‘Environmental Law’ or ‘Environmental Management’ despite being core courses of environmental studies. This is a very critical omission in the curricula, as the majority of specialists working for the government and non-government organisations will have to increase their qualifications by studying abroad. From the given examples, it is apparent that current curricula largely focus on environmental protection, but do not address other concepts of ESD. CAREC (2006) attributed the issue to lack of awareness of university teachers and administration about SD. By contrast, Azizov (2016) asserted that ESD was partly integrated into subjects of ‘Ecology’ and ‘The Protection of the Environment’ in pedagogical institutions andpointed out that the syllabus included some general ESD notions, such as gender equality, HIV/AIDS prevention, and health. However, ESD’s aim of ‘capacity building’ (Vare and Scott, 2007) of individuals was overlooked by authorities and therefore by most students, and even teachers. Despite the fact that tertiary institutions have general EE classes, graduating future educators are not well trained to include ESD concepts in their practice. Therefore, training current and early career teachers has become the task of TTIs. However, ESD at TTIs is also still focused on environmental topics (UNECE, 2009). This can be explained in the same way that was mentioned above, in the example of HE. However, the EE of TTIs is slightly different from HE courses, because the duration of teacher training courses is limited to one month. Thus, the task of training for ESD is an extra load to in-service training courses. As the time frame of training cannot cover complete training of ESD, these courses are mostly restricted to delivering only the basics of ESD within several hours of training. One of the leading TTIs in Tashkent reported that they had only an eight-hour program of ESD training (UNESCO, 2010). Obviously, the integration of ESD in teacher training programmes is not fully applied, but considering the limitation of time, it should not be regarded as unsatisfactory. Rather, policymakers should consider solving the problem in a rational way. In general, EE has been the main course both in HE and TTIs. This is completely reasonable from the environmental perspective of the country. However, economy, society, and the environment are inextricably linked to each other. It is impossible to maintain the sustainability of the one without considering the others. Therefore, maintaining the environmental sustainability will remain a challenge, without addressing social and economic problems in the country. Vlek et al. (2017) pointed out three major challenges in the implementation of ESD: lack of competent trainers, deficiency of ‘networks’ to share experience, and the absence of teaching and learning materials (p. 60). Assimilating the experiences of foreign countries might be one of the possible solutions. For example, establishing an ‘ESD Society’ as a national network for SD in HE, or ‘eco-school programmes’ as an agenda to encourage schools to create their own sustainability programmes, such as in Hungary, would be very effective (UNECE, 2009, p. 35). Moreover, launching a journal of ESD would also enhance communication among researchers and practitioners, and strengthen the dialogue between administrators, scholars, and other benefited stakeholders. However, these are associated mainly with teaching processes. There are some other challenges which address a broader scope of ESD. One of the main challenges is to develop a consciousness of sustainability amongst students, teachers, and university staff. The implementation of ESD is not only restricted with the introduction of the subject into the curriculum and textbooks, but it also includes shaping the attitudes and behaviours of people towards SD (UNECE, 2005). It would be more logical to take regular practical actions such as roof gardening, “ditch disposable" campaigns, eco-energy programs, waste management within campuses (which are successfully implemented at the University of Hong Kong). They are very cost-effective and practically viable for most HE institutions. The implementation of ESD in formal education has a preliminary character, and legal bases are outdated, mostly reflecting MDGs. Therefore, the concept of ESD should be revised to consider future focal points towards achieving SDGs based on national interests. More emphasis should be directed to monitoring of the implementation. Also, there is a huge gap in awareness between the actors on the top and performers at the bottom. According to Vare and Scott (2007), policymakers regard ESD as a tool for delivering knowledge about SD and the authors expressed their worries against such policy. They pointed out that ESD should be a ‘learning process’, i.e., a bottom-up process in order to be successful (p. 5). Therefore, the government should also pay attention to raising awareness of the people through non-governmental organisations and volunteering groups. There are only a small number of such groups in the country and their activities are limited to specific areas, specifically in the capital only. Extensive implementation of ESD requires amending curricula, creating new textbooks, training teachers, renovating and modernising school buildings and so forth, which have been an excessive economic burden for the government. However, when financial barriers mount, goals seem unachievable, making the situation even worse. Today, if humanity transgresses the boundaries of the environment, the outcomes will be detrimental to the population of the world. Hence, maintaining the sustainability of the environment, economy and society has become a necessity in each country. The best way to do so is to educate people to live, act and think sustainably by infusing values of sustainability. Education can play a critical role in transformation to sustainability and long-term development in the country. The people of Uzbekistan have already experienced the dire consequences of unsustainable water management and irrigation, such as with the Aral Sea destruction and water crisis. Therefore, there is a need for further consideration of state policy to create efficient and sustainable learning environments at HE systems through combined efforts of stakeholders, community, government officials and international organisations. Azizov, A. A. (2016). Оценка действий Республики Узбекистан по внедрению образования в интересах устойчивого развития в систему среднего и среднегоспециального образования [The Assessment of Actions of the Republic of Uzbekistan on the Implementation of Education for Sustainable Development in the System of Secondary and Secondary Special Education]. UNESCO Report, Tashkent. Vlek, P. L. G., Eshchanov, R., Khodjaniyazov, S., Rudenko, I. & Lamers, J. P. A. (2017). From Theory to Practice: Challenges and Constraints to Introducing Education for Sustainable Development in Uzbekistan. In Michelsen, G. & Wells, P. J. (Eds.). A Decade of Progress on Education for Sustainable Development: Reflections from the UNESCO Chairs Programme (pp. 59-65).Paris: UNESCO. United Nations Economic Commission for Europe (UNECE). (2005). The UNECE Strategy for Education for Sustainable Development.Vilnius. United Nations Economic Commission for Europe (UNECE). (2009). Learning from Each Other: The UNECE Strategy for Education for Sustainable Development.New York and Geneva. United Nations Economic Commission for Europe (UNECE). (2010). Environmental Performance Reviews: Uzbekistan. Second review, 29. New York and Geneva. United Nations Educational, Scientific and Cultural Organisation (UNESCO). (2009). Review of Contexts and Structures for Education for Sustainable Development 2009.Paris: UNESCO. United Nations Educational, Scientific and Cultural Organisation (UNESCO). (2010). Education for International Understanding through In-service Training: Uzbekistan Experience, EIU Best Practices, 10. APCEIU. United Nations Educational, Scientific and Cultural Organisation (UNESCO). (2013). UNESCO Country Programming Document for the Republic of Uzbekistan (2014-2017).Tashkent: UNESCO.